The famed Artemis series of luxury motor yachts emanates from the famed Selene line of world cruisers.. These strikingly innovative and stylish yacht range from 56 to 82. Artemis Yachts appeal to a variety of discerning mariners and sea goers. In addition to the noticeable elegance and attention to aesthetics, the Artemis line was also created with both performance and cruising comfort in mind. They are sea friendly yachts able to cruise effortlessly through a range of adverse weather and water conditions. 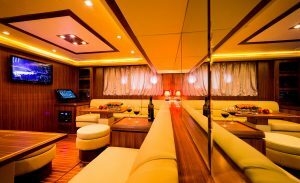 Artemis Yacht feature open plan interior layouts with commodious en-suite staterooms. Thanks to the galley-down design, each model offers significant room for comfortable salon areas to open to large aft decks through sliding glass doors. Above, there are large fly bridges featuring helm stations and plenty of lounging areas for sun lovers.